The Internet is a treasure trove of photographic imagery. Artists and designers often combine media elements from this visual archive in inventive ways or use downloaded images as research for their own creative work. While we admittedly live in a "copy/paste culture," using a downloaded image from the web has legal ramifications governed by copyright laws. Thankfully copyright law protects certain types of Fair Use of copyrighted material. In addition to Fair Use, many works are in the Public Domain or are licensed Creative Commons. Determining what is protected, what is Fair Use, and what is free to use is part of the cultural producer's job. A few search techniques will make it easier to successfully sort through the vast online image archive. Understanding some central principles of Fair Use is helpful when thousands of protected images are only a mouse-click away. 1. 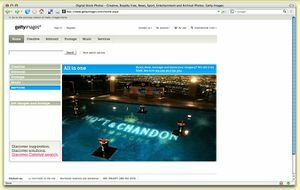 Open Google Image Search (http://images.google.com) in a web browser. 2. 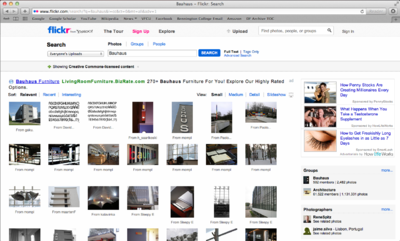 Type the word "Bauhaus" into the search field and click the Search Images button. 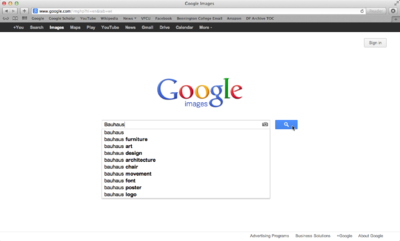 The search engine will return all images related to the word "Bauhaus." The Bauhaus was a revolutionary arts and design school that operated in Germany from 1919 to 1933. The Bauhaus defined arts education for the 20th Century and beyond. You will learn more about the Bauhaus throughout this book. 3. Filter your results by file size. Click on the button labeled 'Search Tools' on the toolbar below the search field. This will show a menu that will allow to you filter your results by size. Click on the button labeled 'any size'. This will bring up a list where you can choose from a range of small to extra large images. Select "large images," and release the menu. The page will reload only showing images larger than 600x800 pixels and smaller than 1200x1600 pixels. 4. Expect errors! Nearly every search result produces errors. Sometimes errors follow a pattern that can be identified and excluded from the search query. 5. Results can be limited by searching for a specific phrase. To search by a phrase, enclose the words in quotes. 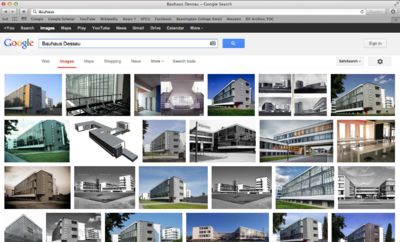 Do a search for "Bauhaus Dessau." Make sure to reset your image size to "All Image Sizes." 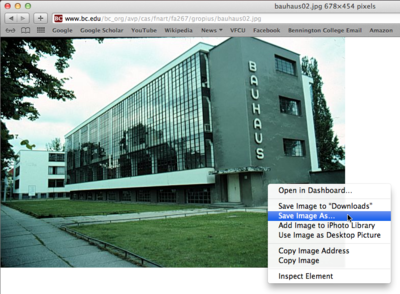 Your results should include images of the Bauhaus Dessau. Dessau, Germany was the location of the Bauhaus from 1925-1932. Search Tools will give you control over additional parameters, such as filetype, color mode, and so on. 6. 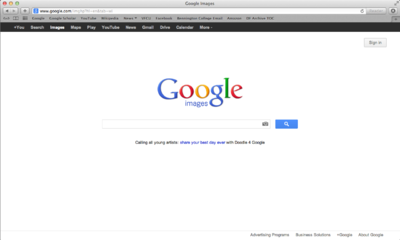 Click on one of the images from your search to bring up the Image Results page. 7. Click on the link, "See Full-Size Image," to load the full resolution image in its own window. 8. Download the file by dragging it to your desktop, clicking File>Save, or right-clicking the image and choosing Save Image As. Save the file in a location on your Hard Drive that will be easy to locate (the desktop or documents folders are typical storage locations for short working sessions). Just because you can download an image doesn't mean you can use it! An image may be protected by copyright laws. Similar to a patent, a copyright is a legal tool for preserving control over the use of a creative work. Books, poems, music recordings and compositions, photographs, paintings, sculptures, radio and television broadcasts, films and even dances can be copyrighted. The Artist Formerly Known As Prince even has his symbolic name, "Love Symbol #2" ( ), protected by copyright law. England initiated the copyright laws familiar to today's citizens as the Statute of Anne (1709). By the 1700s, the widespread use of the printing press and an increase in literacy rates resulted in printers commonly reprinting texts without crediting their rightful authors, or paying them. The Statute of Anne gave the author the exclusive right to a work for a fixed period of time. Copyright durations vary by nation. In the United States the length of a copyright used to be the life of an author plus 50 years; on the 50th year after the death of an author, their works would be released into the public domain. For works created by corporations, the length was 75 years from the date of publication. In 1998 congress passed the Sonny Bono Copyright Term Extension Act, which extended copyright by 20 years. This law was authored by a musical-entertainer-turned-Congressman, and was heavily lobbied by the media industry. The act became known as the "Mickey Mouse Protection Act," as Disney lobbied extensively to insure that the law reached back just far enough to protect their copyright over Mickey Mouse. Public Domain images have no licensing restrictions. An image automatically enters the Public Domain when a copyright expires. Public domain is currently under attack, as media corporations struggle to control their monopolies. The irony is that copyright was introduced to protect authors from this type of monopolistic power. To find out more about Free Culture, Public Domain, and the Creative Commons, visit http://CreativeCommons.org, or http://lessig.org. Lawrence Lessig is one of the founders of Creative Commons and the Free Culture movement. the use qualifies as "fair use"
Several alternative licensing models exist, the most popular of which is a Creative Commons license. Creative Commons operates under the moniker "Some rights reserved" and offers a range of licenses with subtle degrees of control over whether derivative works and for-profit uses are allowed. Wikimedia Commons (http://commons.wikimedia.org), and Flickr (http://flickr.com/creativecommons) focus partially or exclusively on public domain or Creative Commons licensed images. 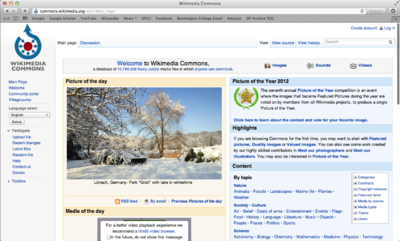 Wikimedia Commons is an archive of Public Domain and Creative Commons images. Much like Wikipedia it is organized by historical subjects, and is collectively edited and maintained. 1. 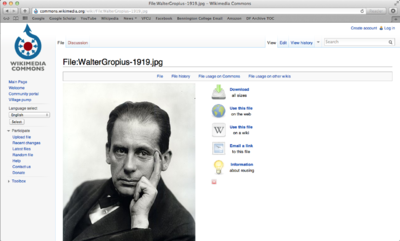 Go to the Wikimedia Commons (http://commons.wikimedia.org) and search for Walter Gropius, the founding director of the Bauhaus. 2. View several of the images, and notice that the images are either Public Domain or licensed Creative Commons. 3. 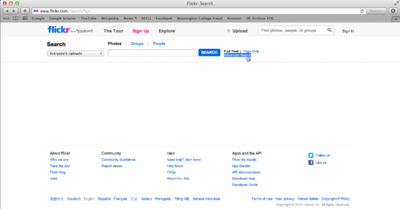 Flickr is a photo sharing site that encourages the culture of sharing through many of its features, and many Flickr users license their photographs under Creative Commons. 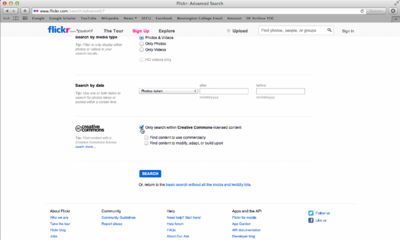 Go to Flickr (http://flickr.com), click on the magnifying glass next to the search bar, and then click on Advanced Search. 4. 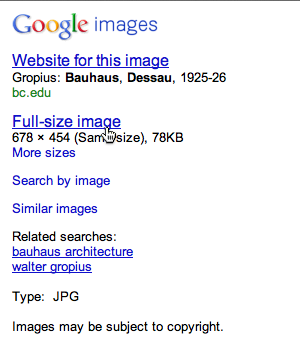 Type in Bauhaus, and select "Only search within Creative Commons-licensed photos." Everything in your search will be CC licensed, though not all will allow derivative works (for example, using the image in a collage) or commercial use. 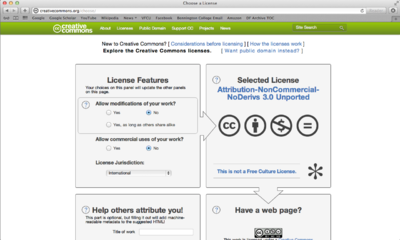 Licensing work with a Creative Commons (CC) license is easy. Upon setting a Creative Commons license, the creator of the work decides if both commercial and noncommercial uses are allowed (some are noncommercial only), if others are allowed to modify the work once it is licensed (called, "derivative work"), and if derivative works are allowed, whether or not the newly modified work also has to be licensed with CC (called, "share alike"). 1. Attribution Non-commercial No Derivatives (by-nc-nd) This license provides the least freedom to others as the work cannot be used for commercial purposes and derivative works cannot be made (in other words, it would be illegal to use this work as part of a collage). 2. Attribution Non-commercial Share Alike (by-nc-sa) This license allows others to build upon the original work (for instance, this work could be used, legally, in a collage) as long as the new work is also licensed in the same manner, with a CC by-nc-sa. 3. Attribution Non-commercial (by-nc) This license allows others to build upon the original work (this work could be used, legally, in a collage) without having to license it as a CC by-nc. However, the resulting work cannot be used for commercial purposes and the original author, as with all CC licenses, must be credited. 4. Attribution No Derivatives (by-nd) This license allows others to use the work as it is, without making derivative work, for any purpose (commercial or noncommercial). 5. Attribution Share Alike (by-sa) This license allows others to use the work as it is or in derivative forms, for commercial and noncommercial purposes, as long as the new work is also licensed with the same CC by-sa license. 6. Attribution (by) This license provides the most freedom to others who want to use the licensed work. Reproduceablity is a principal trait of digital media. Unlike paintings, records, books, videotapes or even photographs, an exact replica of digital media can be made from the original file. This is true for digital photographs, Compact Discs (and MP3s), DVDs, and websites. 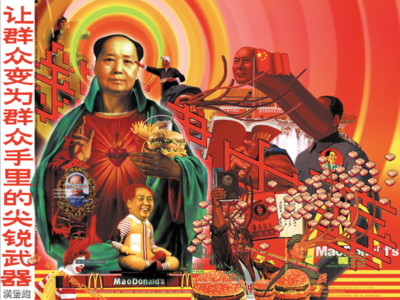 From sampling to mashups, collage to subvertisements, contemporary artists and content creators use digital files as source material for the derivation of new works. These works are considered new and original, but they are sometimes built with bits and parts of copyrighted works. In the digital age, new works are often created when more than one existing work is recombined in a new way, providing new visual relationships and new ideas. Fair Use is not piracy! Fair use is legitimate and legal use of copyrighted media, as protected by copyright law. Fair use is free speech. Fair use is not file sharing. Weighing these four factors in a copyright case is not an easy task, which is why judges have been asked to do so. However, successful commercial media that takes advantage of the fair use clause include Saturday Night Live skits, The Simpsons cartoons and Weird Al Yankovic songs. Caption: 60X1, Kenneth Tinkin-Hung, date?. This net art parody is protected by the fair use clause of the United States copyright laws. Appropriation is a word that is used by media artists to describe the visual or rhetorical action of taking over the meaning of something that is already known, by way of visual reference. For example, Andy Warhol appropriated the Campbell's soup can visual identity to make large, iconic silkscreen prints of the face of Campbell's soup cans. Warhol's soup cans are a modified version of "the real thing." The visual reference to the original soup can is important, as the viewer needs this information in order to understand the idea that the reference conveys (your personal translation of this could be something as simple as a popular American icon to a feeling associated with comfort food). By transforming not only the size and limited graphic palette for portraying the soup cans, but also the place where the viewer will encounter them (an art gallery as opposed to the grocery market), Warhol appropriates the original Campbell's soup cans to create American art that relates to popular culture in its iconic form. Appropriation falls into the category of fair use. Ironically, we do not have copyright permissions to use Warhol's paintings or photographs of Campbell's soup cans in this book! Try an image search if you're curious about viewing this work. Caption: Fountain, Marcel Duchamp (aka R. Mutt), 1917, ready-made object photographed by Alfred Steiglitz. Marcel Duchamp was the first artist to appropriate a common object in his art. This challenged the art community in its definition of what is or is not labeled, "art". His ready-made sculpture was a urinal transformed into a sculpture because Duchamp signed his pseudonym, R. Mutt on the urinal and submitted it to an art exhibit. Duchamp believed that when an artist declared an object a work of art, the object truly becomes art. In this act of appropriation, the everyday object becomes something other than what it once was. 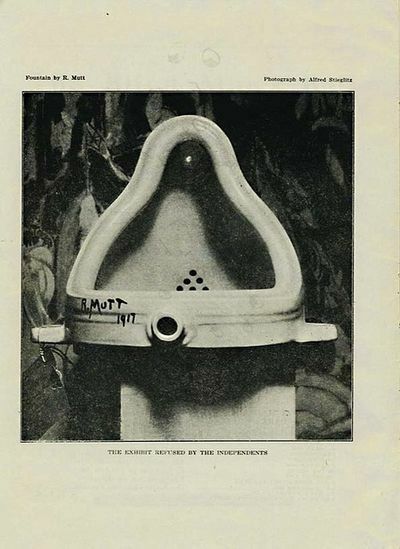 In the case of the urinal, the transformation included the addition of the signature to the porcelain, the change of location (from a bathroom to a gallery), and the change in purpose (whereas before the urinal entered Duchamp's hands this may have been untrue, after 1917 no one has used the urinal that R. Mutt has signed for the purpose of waste containment). The disadvantage is that the photographs are generic, and have the impersonal feel of an advertisement. No one ever looks as happy as a model in an advertisement; most people are as physically attractive there is an overall "generality" to the photographs. This young woman looks nothing like the two of us as we sat at our computers editing this book on a wiki interface. No one talks on his cell phone with such a big smile as this man! 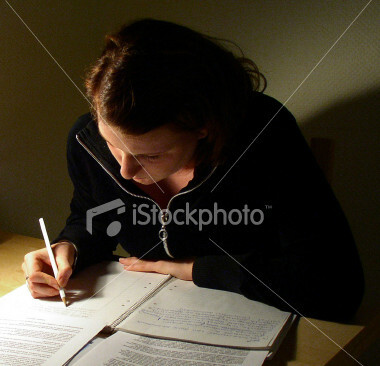 Stock photographs are staged. These images should be used carefully, as the level of authenticity of the action within the image is noticeably low. 1. 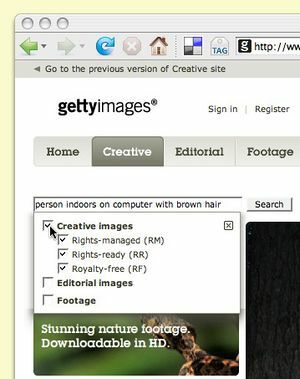 Go to Getty Images (http://GettyImages.com) and search in Creative Images for an image of what you are doing right now. In my case, that is "person typing at computer indoors." You might type "person reading book on couch." Try adding specifics like your hair color or the types of clothes you are wearing. To search in Creative Images, check the box labeled 'Creative stock images' that appears when you click in the search field. 2. Refine your search with their search phrases. 3. Ask yourself if anyone ever looks quite that content, pensive, or photogenic while reading a book unless they are acting for the camera. One strategy for using stock photography is to radically alter the original image, either through extreme image adjustments in Adobe Photoshop, or by tracing the image in Adobe Illustrator. As a transformation to the image, this kind of treatment usually results in using the image under the clause of fair use. 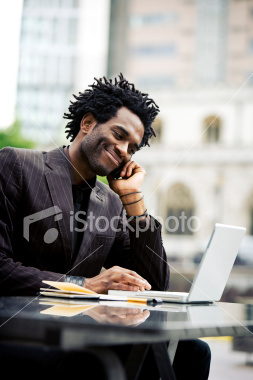 The following image was created from a collection of stock photographs. Notice how any photographic information has been modified and abstracted in an illustrative form. Caption: From the series, Wish You Were Here! Postcards From Our Awesome Future, Packard Jennings and Steve Lambert, 2007, 6' by 4' giclee prints. 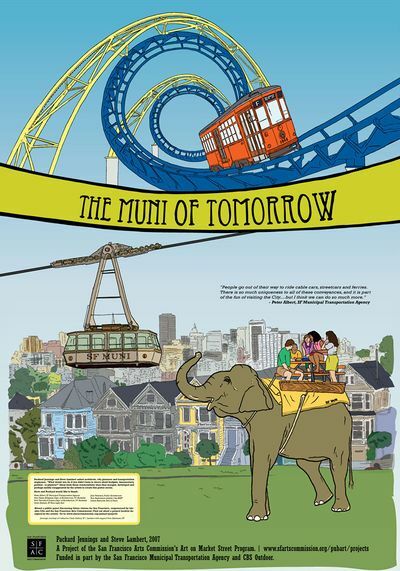 This page was last modified on 14 February 2013, at 11:54. 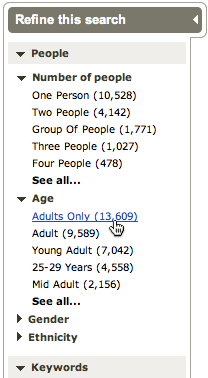 This page has been accessed 77,518 times.